Day 3: RMNP is indescribable and I'm an idiot. 396 miles. Temps 45-82F and sunny. Today started off with some rerouting due to unfortunate information. 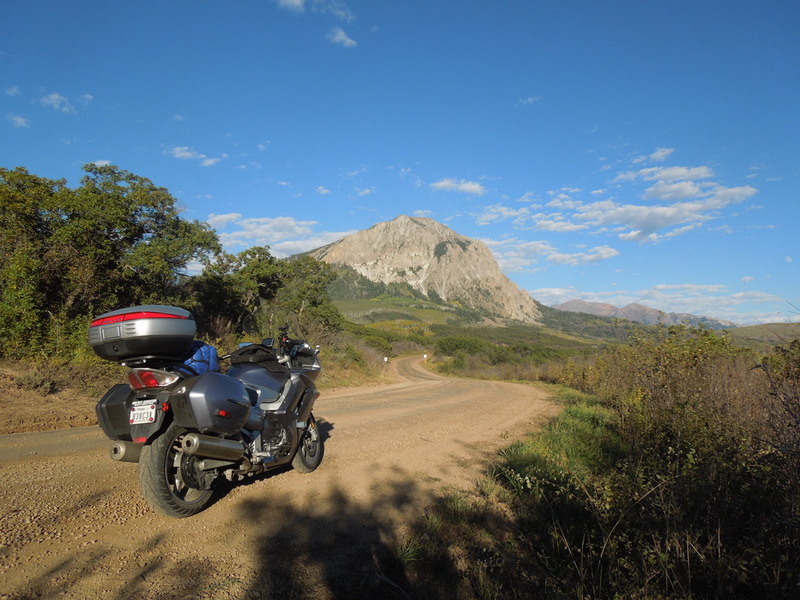 The destination ride for this trip is Kebler Pass, despite it being mostly unpaved. 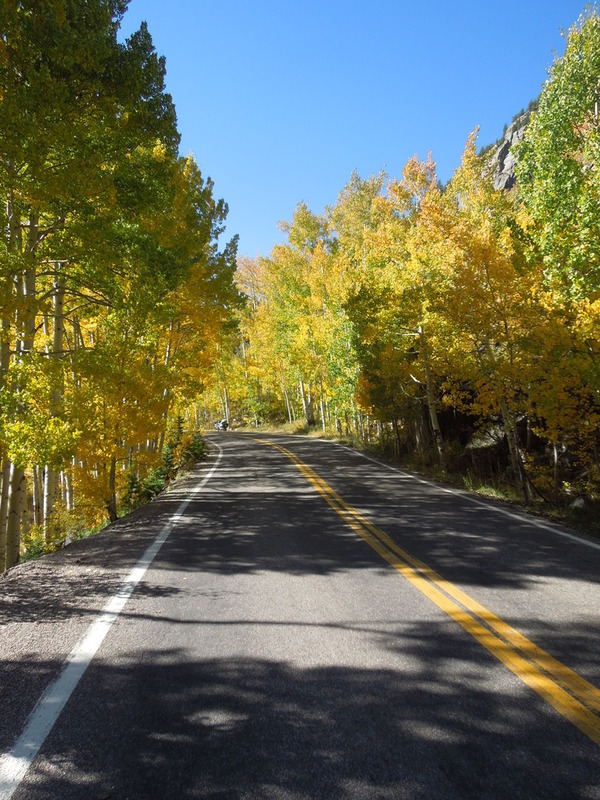 Kebler Pass is the road I was on before wondering what it looked like with all the Aspens turning, and happens to be the most densely packed Aspen forest you can find. 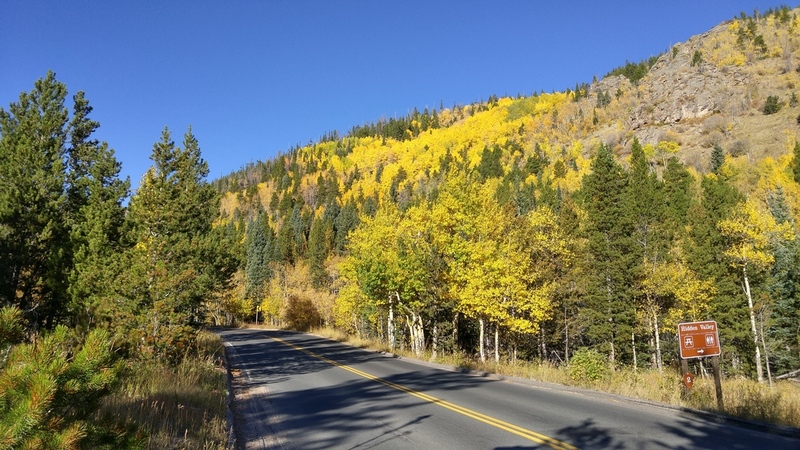 I'd been told to go up and come down 133 to catch 12 toward Crested Butte for some amazing sights and to get me through Kebler Pass. However, CoDot shows that blasting on 133 has it closed for a good portion of the day. Looks like I'll have to save Kebler Pass for tomorrow on the way out, which won't be so bad. 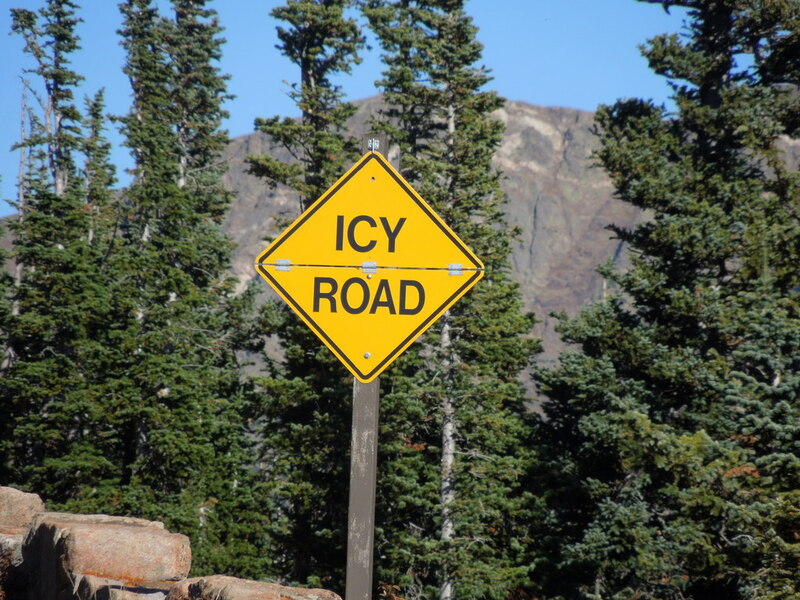 My second issue is road closures for construction coming south after hitting RMNP. 9 sounds like worse closures than 40 so I decide I'll take 40 instead and have to spend sometime on I70. Much as I'd like to avoid the interstates, there's a lot worse interstates to be stuck on than 70. So, with my revised plan, I set out at sunup. 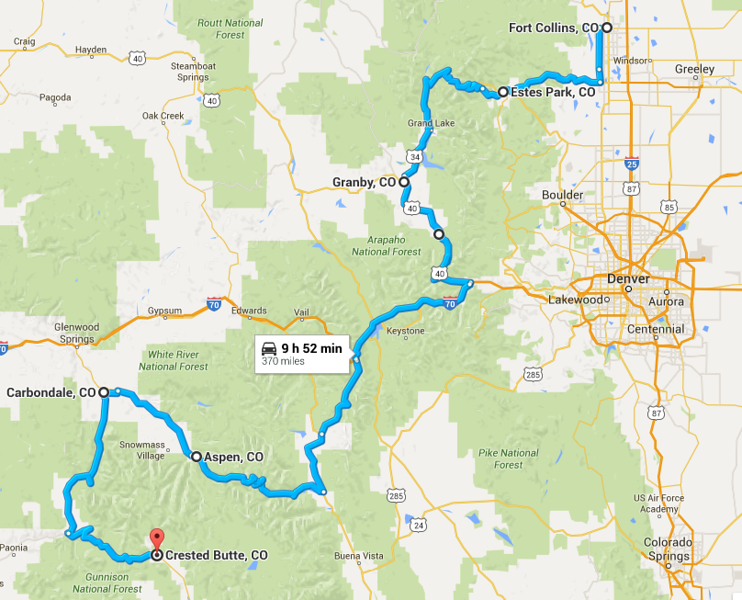 I head south and then west through Loveland. Shortly outside of Loveland the temps start plummeting so I stop and don my heated gear and crank it up so I'm warm and toasty and enjoying life. I don't know what to say about Rocky Mountain National Park. I don't think I can accurately describe it, nor are there words with enough weight to do the job. Around every bend I was saying aloud in my helmet "Wow!" I have no idea why in the number of times I've been to Colorado I haven't been here, but it'll be on the itinerary from now on. I came out of RMNP and continued on my route down to Granby and then headed south on 40 and pulled off in Winter Park for some lunch. I had a meatball sub at Rudi's Deli, self proclaimed "Best Sandwiches in town." The sandwich was fantastic with a little bit of spicy heat in the meatballs, but the sandwich was a little too small for my liking. Still, enough to keep the tummy going. While there, I got a report from a friend in Denver who saw on the news that there'd been a small snowstorm at the Eisenhower Tunnel. I checked traffic reports and also due to construction there was a bit of a backup there as well. I'm pretty stuck at this point because it's either plow (literally) ahead or backtrack and take my chances with the closures on 9. If I'd still planned on hitting 133 at this point there were other options but right now they were limited. I figured, you don't have an adventure by routing around adversity, so I continued on. I got kind of lucky in that the construction on 40 was very minimal. I was stuck in traffic on 70 for about 30 minutes due to a lane closure right before the tunnel, but the snow was completely gone by the time I arrived. 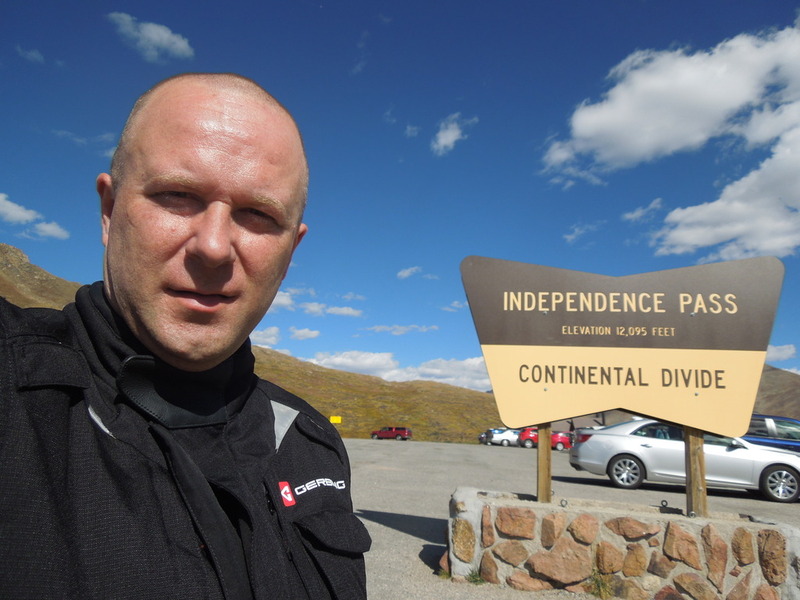 I exited 70 at Copper Mountain and started south on 91. 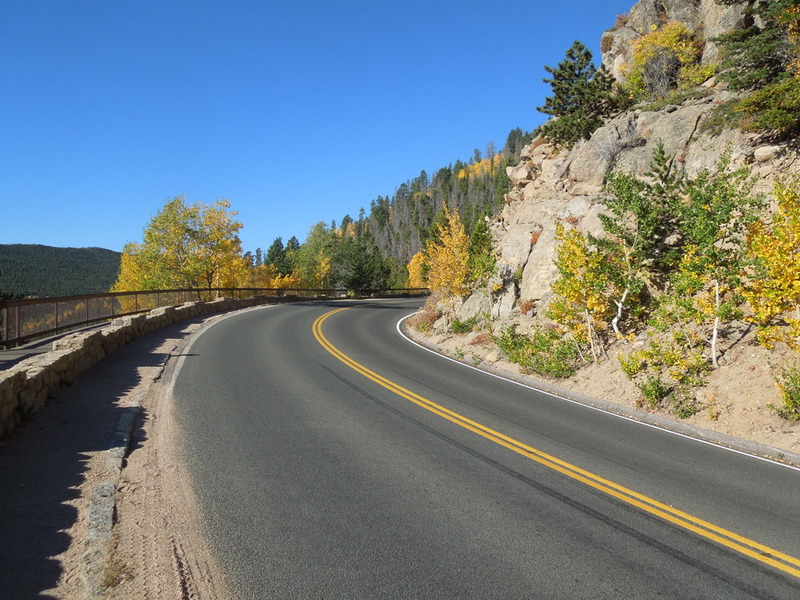 I'm doing routing and timetables in my head and realize if I take my original route up through Aspen, I'll get to ride Independence pass and will hit 133 after the road closures end so I can still ride Kebler Pass. Off I go. Independence Pass, wow. 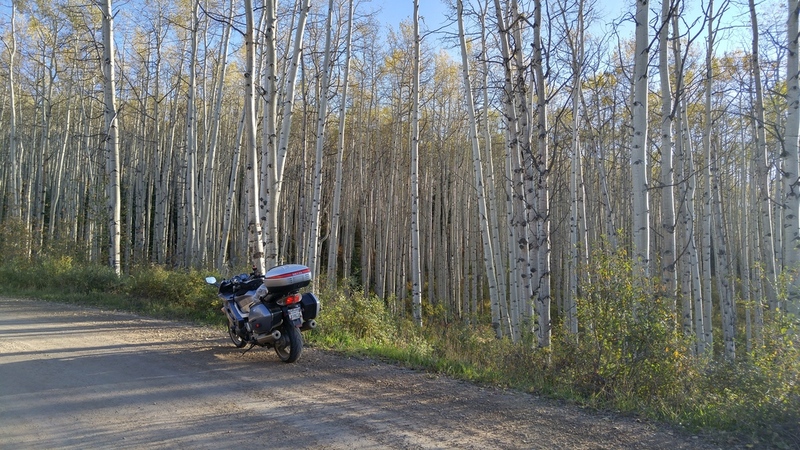 I saw enough turning aspen trees here to satisfy me for sure. What a fun road and amazing scenery along the way. A little bit of traffic and some places with only one lane for both directions to share, but well worth the trip. As I roll into Aspen I'm doing the math in my head. I haven't used much gas, but I don't think I have enough to make it to Crested Butte, and if I do I'll be rolling in on fumes. Kebler pass is no place to run out of gas so I decide I'll top off here. I pull into the Shell station on Main street and here's where my day takes a turn for the worse. ***Explanation for the non motorcyclists reading this on my blog. A motorcycle can have two stands. A side stand much like the kick stand on a bike, and a center stand that lifts the rear tire off the ground and keeps the bike upright. Filling up with gas on the centerstand means no air bubble in the tank from being leaned over meaning you can get a little more gas in the tank, so I usually fill up on the centerstand, especially on trips. So I pull up and stop in front of the pump, and as I've been doing on the trip I put down my kickstand. I'm not tall so swinging my leg up and over the seat plus the bag on the passenger seat is a bit of a trick, and I'm afraid of catching my boot on it and dragging the bike over on top of me, so I start off with the kick stand. Once off the bike I put the bike up on the centerstand and continue on with my fueling. So, as I step off the bike with my bike on the sidestand I glance at the gas prices. I'd previously been put off by the $2.39 I'd paid but now in Aspen I'm about to be robbed at $3.99 per gallon! I swear I heard a "Snap...fizzle" inside my head when I saw that. I turned around and put the bike on the centerstand and paid the money and pumped the gas. Now, let me set the scene. Main street is at a standstill full of cars immediately to my right. The parking lot for the Shell station is full and every pump is in use with people standing or milling about. Basically, a very public place here. So I hop on the bike and ease it off the centerstand, not realizing the side stand is still down. The suspension compresses and the side stand hits the ground, launching the bike off to the right. The suspension rebounds and continues the rightward motion. My foot is down and I know I'm way past the point of no return, I've got to set it down as easily as possible but it's going to be far from gentle considering all the top weight I have with my stuff and the rate of decent. And bam. There in front of everyone, my bike is on it's side and I'm sprawled across the pavement. Not hurt, but humiliated and worried about what may be broken on my bike so far from home. At this point I don't know why it went over but I manage to roll over and hit the kill switch to shut off the bike. As I stand up I see the kickstand pointing to the sky. I slap it to it's home position cursing my stupidity. About this point, some poor caring stupid soul comes up and asks if I'm ok. He doesn't seem to have a clue what he's talked himself into by coming to my aid but it comes to realization with the words that come out of my mouth. "I'm ok, but can you help me lift it up, it's extremely heavy." I've picked up the FJR on my own, and it's no picnic. However, with a full load of traveling gear it's not going to be a one man job. We proceed to start picking the bike up and it's at this point that the 8000 feet of elevation decides is a good time to try to kill me with lack of oxygen. We manage to get it upright and I realize I'm on the wrong side of the bike to put the kickstand down...yes, the very one I just put up. Helper runs around and puts it down and we get the bike settled back to a normal upright position. My side bag took the brunt of the fall and is scratched all to heck. No cracked cases and the frame slider did it's job. I look at the mirror and it's folded back on it's pivot so all I need to do is fold it back to normal position and get out of here. When I touch the mirror I find it's not folded, but bent..bent and broken. 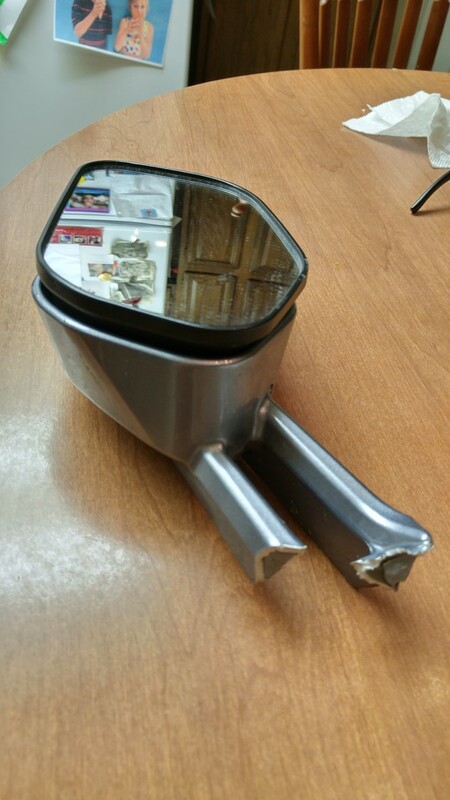 The mirror snaps off at the stalk and falls off in my hands. It's pretty useless but instead of putting it in the trash bin, I stow it in my luggage, for what reason I don't know. Anyway, finally I'm off and on my way out of Aspen trying to learn to ride and navigate traffic missing my right mirror. Yea, that's a $100 momentary lapse in concentration. I finally make my way onto 133 and it is a very beautiful road. More than that, the run up and over the mountains was a blast with me playing with some Lexus sports car. He led, I followed and had a ball. The area that had been closed for blasting was closed with a flag man, but we got the slow sign instead of the stop sign and cruised on through. There was quite the backup on the other side though trying to go north. I turned off and finally, after all this time, hit Kebler Pass. Sadly the Aspens here were very confused. Some were in peak, but very few. Most were still about half green, some were fully green, and some still had already dropped their leaves. Still, it's a beutiful ride and I'm glad I got to do it. 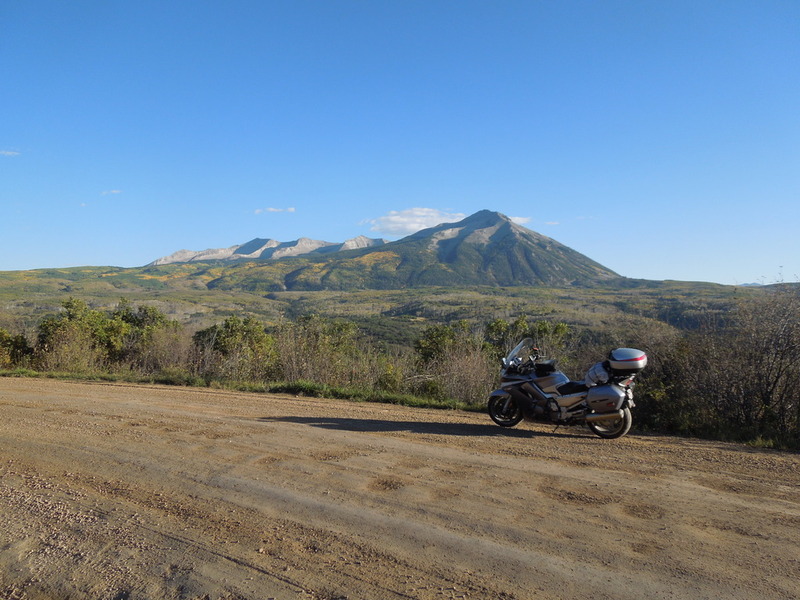 Riding dirt on the FJR isn't a piece of cake but it's doable and I was cooking along at 40mph in some places. It's one of the few roads though where I was waving cars past instead of looking for places to pass. 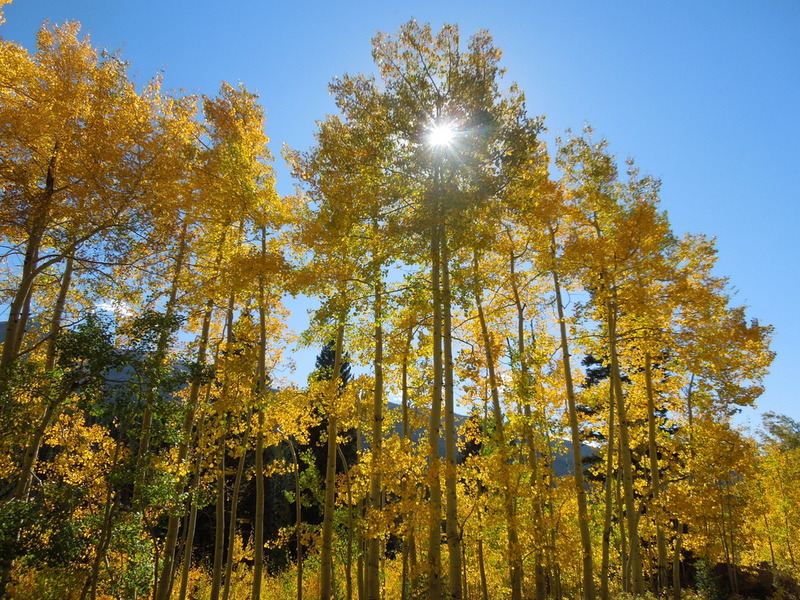 It's amazing to be back in the Aspen forests with the white trunks so close together for as far as you can see. Finally I arrive at my wife's uncle's house in Crested Butte South. He and his girlfriend Cathy and her daughter put me up for the night. Joel grilled organic chicken breasts from a local farm while Cathy fixed couscous, rice with brown gravy and some locally grown sweet corn. I chowed down big time and enjoyed the hospitality and catching up. I also spent some time discussing with them and re-evaluating my plans. I'd had several days of sunup to sundown riding I'd put in and in the mountains as well while dealing with altitude. It's quite possible I'm pushing myself a little too hard and that could have contributed to my lapse of concentration in Aspen. A lapse in concentration in the mountains of Colorado can bite you fast and hard. Add onto that the muscle on the left side of my neck and shoulder was giving me some intense pain, I could use an easy day. 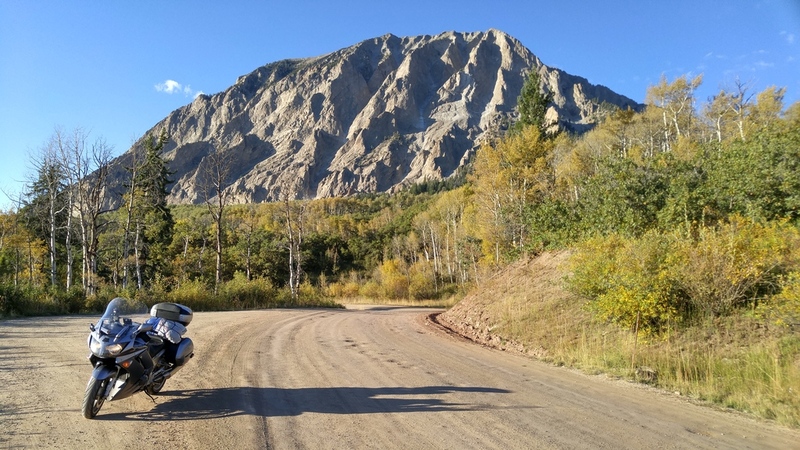 This is why when Joel asked if they could ride with me on his new Harley the next day on a shorter route to Ouray, I readily accepted. I would scratch off the amazing road I've heard about, 141, from this trip and save it for next time...because there WILL be a next time.